Teresa M. (Pepe) Kenney – of Woburn, April 14th at ninety-one years of age. Beloved wife of the late James F. Kenney. Devoted mother of Dennis Kenney, his late wife Susan of Woburn, Paula Doherty, her husband Kenneth of Methuen, Richard Kenney and his wife Deborah of Pelham and Marylee Fisk and her husband Dennis of Tewksbury. Dear sister of the late Joseph, Anthony, Louis, George “Jack,” Rose Ficociello, Frank, John, William, Arthur, and Louise Hede. Cherished grandmother of Shawn Doherty, Kellie Alessandro, Kayla and Leah Fisk, and Jimmy Kenney, Taryn Godfroy and Douglas Mitchell, as well as seven great-grandchildren, she adored. Relatives and friends are kindly invited to attend a Funeral Service in the Lynch-Cantillon Funeral Home, 263 Main Street, Woburn on Thursday, April 18th at 12:30 p.m. Calling Hours will be held from 10:30 – 12:30 prior to the Service. Interment in Woodbrook Cemetery. Remembrances may be made in Teresa’s memory to Home Instead Senior Care, 5 Militia Dr., Lexington, MA 02421. For directions or to leave an online condolence, please visit www.lynch-cantillon.com or Facebook under Lynch-Cantillon Funeral Home. 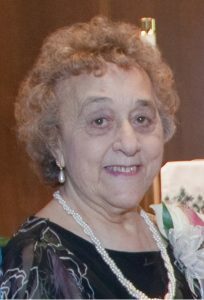 Teresa M. (Pepe) Kenney, 91, a lifelong resident of Woburn, died peacefully, April 14th. She was the beloved wife of 67 years to the late James F. Kenney. Teresa was born in Woburn into a large, traditional Italian family. She was the youngest of eleven children born to the late Paul and Mary (Bozzini) Pepe. She was educated in Woburn and was a graduate of Woburn High School. She grew up learning about her Italian heritage and participated in many traditional family gatherings throughout the year, including “The Feast of the Seven Fishes” on Christmas Eve. Teresa dedicated her life to caring for her family. She raised her four children and helped raise her grandson, Jimmy Kenney, following the death of his mother. She was loving, devoted, generous and would do anything for the ones she loved. In her spare time, she enjoyed talking on the phone with her sister, Louise, and her many friends – keeping up with the latest news and happenings. She also enjoyed shopping and watching TV, specifically cooking shows. She loved animals and, for many years, faithfully fed stray cats in the neighborhood. Teresa had a deep and strong religious faith that she passed on to her family. She will be sadly missed by all who knew her. Teresa is survived and will be deeply missed especially by her children, Dennis Kenney, his late wife Susan of Woburn; Paula Doherty, and her husband Kenneth of Methuen; Richard Kenney and his wife Deborah of Pelham; and MaryLee Fisk and her husband Dennis of Tewksbury. She was the dear sister of the late Joseph, Anthony, Louis, George “Jack,” Frank, John, William, and Arthur Pepe, as well as Rose Ficociello, and Louise Hede-Ferullo. She was the cherished grandmother of Shawn Doherty, Kellie Alessandro, Kayla and Leah Fisk, Jimmy Kenney, Taryn Godfroy and Douglas Mitchell, as well as seven great-grandchildren. The family would like to extend its gratitude and appreciation to all the caregivers from Home Instead Senior Care for the wonderful service they provided which allowed Teresa to spend her final days in the home that she loved. Relatives and friends are kindly invited to attend a Funeral Service in the Lynch-Cantillon Funeral Home, 263 Main Street, Woburn on Thursday, April 18th at 12:30 p.m. Calling Hours will be held from 10:30 – 12:30 p.m. prior to the Service. Interment will be in Woodbrook Cemetery. Remembrances may be made in Teresa’s memory to Home Instead Senior Care, 5 Militia Dr., Lexington, MA 02421. For directions or to leave an online condolence, please visit www.lynch-cantillon.com or Facebook under Lynch-Cantillon Funeral Home. Relatives and friends are kindly invited to attend a Funeral Service in the Lynch-Cantillon Funeral Home, 263 Main Street, Woburn on Thursday, April 18th at 12:30 a.m. Calling Hours will be held from 10:30 – 12:30 prior to the Service. Interment in Woodbrook Cemetery. Remembrances may be made in Teresa’s memory to Home Instead Senior Care, 5 Militia Dr., Lexington, MA 02421. For directions or to leave an online condolence, please visit www.lynch-cantillon.com or Facebook under Lynch-Cantillon Funeral Home. My sympathy and sincere condolences to you and your family. You are in my thoughts and prayers. All my thoughts and prayers go out to all the family. Especially to Richard and Deborah Kenney.